Ariel – A super smiley redhead who was a mermaid and married and became a human. I know, if you were a mermaid, why in the world would you want to be human. Meh. Cinderella – Her name was Ella, she worked in the cinders for her evil step-family so it became Cinderella. She wishes everyone would stop reminding her of her traumatised adolescence. Aurora – I am not going to mention the obvious but the after-effects of that spindle sleep have become a diagnosed condition for her. Plus she only wears leather now, afraid of any cloth because it came from a spindle. So we all know Snow White right? You know, the fairytale with the chick with really retro short black hair (come one, she is a princess, they always have long hair) and the evil stepmother out to get her? She is closest to Cinderella *shouts in background*, sorry, ELLA, due to their mummy issues. Well anyway, poor Snow White has the most unusual phobia. She is dead scared of apples. Every since she took a bite of that poisoned one, she is quite paranoid. She cannot eat a nectarine or peach because it resembles an apple! She can’t even eat dried apple. Yes. It is serious. And because of it, her stepmother is laughing away in prison. Go figure. So as much as this sleepover was for the princesses to enjoy themselves together and goss it up about Rapunzel’s new haircut or Mulan’s wedding, they needed to get Snow White over her fear of apples. They coaxed her with small pieces of skinned apples resembling potatoes and canned pie apple but she threw up or ran and hid in the closet. So they called me, their fairy godsister. I am actually a great niece of Cinderella’s Bippity-Boppity-Boo godmother, didn’t you know? And I had the perfect recipe in mind. It tastes like an apple. But with so. much. more. The apple is so moist, tender, perfectly cooked and soft but still shape holdable 😀 The filling for the apple absolutely melt into it, and the sugar caramelises as the maple syrup runs its juice in and around the apple. The best part? It takes 2 minutes to make in the microwave. 2 minutes. I stuffed some hot filling and apple, combined with vanilla ice cream, into Snow White’s mouth before she could protest and what do you know. She melted. Then she got into a catfight with the other princesses who all wanted a bite. Makes: One just for you! 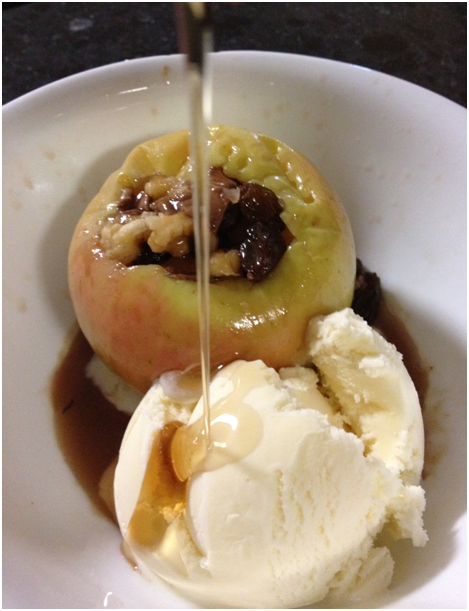 Let apple cool (naaah, actually don’t ;)) and serve with vanilla ice cream, drizzled with more maple syrup! If the apple I was presented looked like that, I don’t think I’d care if it was poisoned – I’d wolf it down anyway! Ugh, I love apples! And I love that you made a faux “baked” apple in the microwave!! Yum! I’m definitely trying this. And ps, your post reminded me of when my friend and I a few years ago spontaneously began singing (at the top of our lungs) Little Mermaid songs in her car…..and we were 25 years old. LOL. We’re never too old for princesses!! I love your new blog look Uru. Very nice. You are one hell of a story teller. That was a fabulous read, I could almost imagine the disney chicks falling over each other to come get you, and then get a taste of the fab apple ice cream thing. I’m quite like snowwhite in that respect – cannot ever appreciate an apple. But this makes me want to try it for the first time. If that’s not inspiring, I don’t know what is. You truly deserve that award. Congratulations!!! Now that’s how to eat an apple!! Hellllo! I’m back and I LOVE the new look! I loved the story with this recipe and these are sooo tempting…no! I’m meant to be being good this week….I was very naughty on my birthday week…. drooool! What an adorable and delicious post! Thank you for sharing! I love that this dessert is made for one, and all you have to do is stuff it and throw it in the microwave. How easy is that? I’ll have dessert in no time. The addition of the ice cream puts this delicious dessert over the top. I love reading your stories, Uru! I am so confused – I want to eat warm baked apples but am distracted by the cute cookie wallpaper !!! I love how pretty this looks and so healthy! What a great-looking baked apple. I haven’t had one in ages…such a grat dessert. 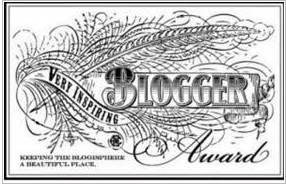 I have submitted my entry and added the button and would love to see my blog up there with so many fnatastic bloggers! I love your new look here!! The cookies are a great idea! And I love, love, love baked apples 🙂 So delish. And this was a very entertaining read, my friend. 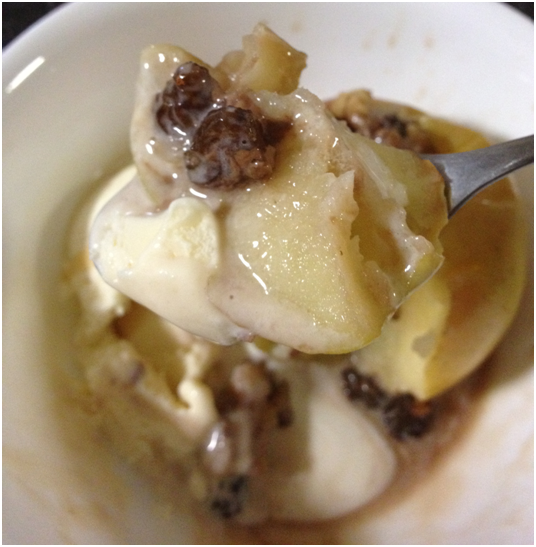 That baked apple dessert makes me hungry Uru. Love that mm peaking cookies. But oh dear heavens woman, please save yourself the awfulness and buy real maple syrup!! I say this out of love for your tastebuds. What an imagination you have! Couldn’t stop smiling :-). Great dessert, and quick too! I will be all over this come fall. Yum! And Disney princesses are still fun no matter how old you get. Oh this looks scrumptious! !I know my family will love this since we’re big time apple dessert lovers :)Thanks for a lovely recipe U!! First off….you changed your blog….I LOVE IT!!! Absolutely delicious looking! Second of all…..this recipe is fabulous! It’s an apple…..so it’s healthy! Right? I love your new look! So bright and yummy enough to eat! Plus this apple too! What a yummy and kind of healthy treat! Apples are almost in season here – can’t wait. I’m not sure who would enjoy this post more, me or my darling grand-daughter. I know one thing for sure though, Tabitha would absolutely love this delicious looking baked apple, as would I. Thank you so much for sharing, Uru and congrats on the awards. In Tabi’s words, You Rule!!! P.S. LUV, LUV, LUV, the new look!!! Oh yum!!!! I am doing these with the apples I have on the counter. Now the questio is…I have two. Should I share or eat both myself? great intro 🙂 I love Walt Disney’s movies but never thought of the characters like you 🙂 that is inspiring. And stuffed apples – always! Yum I love baked apples and these sound wonderful! I love disney movies. I grew up very close to disneyland. My great aunt Evelyn worked on the original snow white film, splicing it together in a little garage with another woman, across the street from the little disney studio in Hollywood.Walt Disney himself met with them…just a bit of trivia for you. This is another very clever post, my friend. Love the princess humor and the twist on the baked apple. Well done! I’m crazy for baked apples…one of my all time favorites! Congrats on your award…well deserved! I adore baked apples – they are the perfect winter dessert. These look delish! I love microwave apple recipes! I will have to try this….it looks too tempting! Congrats on ur new blog look….. This baked apples look really great… When I was at ur age I could not even think of baking anything, I was a bake/cook disaster…LOL… You are a very talented gal. I LOVE this new look! It’s easy to read, surrounded by the lovely Smarties Cookies and I really like several posts at once being visible. Congratulations on the Award too! We love Filled Baked Apples at our house but I’ve never done them with chocolate or maple syrup, only with raisins and golden syrup. We’ll be trying your version. They are brilliant stuffed with Christmas mincemeat too. Do you have that in Australia? And you mean fruit mince pie stuffing? That is a fantastic idea :)!!! I would love taste that! Hahaha, I love your stories. They always make me smile. I love your new blog theme, and these apples are sure to cure anyone’s apple phobia. Oh my gosh I loved this! 😀 Thats one awesome recipe, too! I can just imagine this combination of flavours being so good. 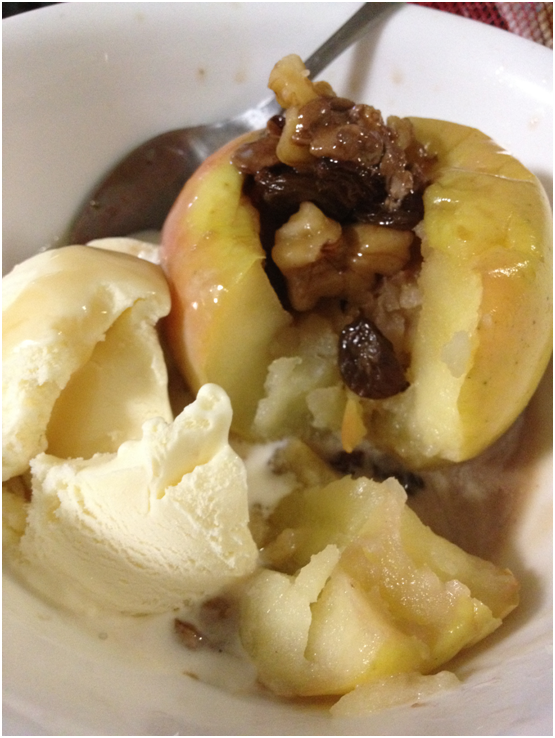 Microwave baked apples are one of my go-to in a hurry desserts. Love them. 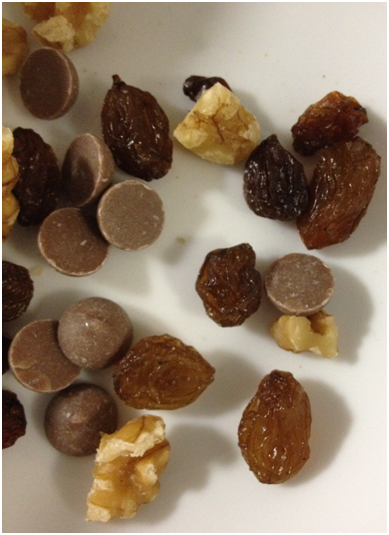 And a great idea to add chocolate chips too. 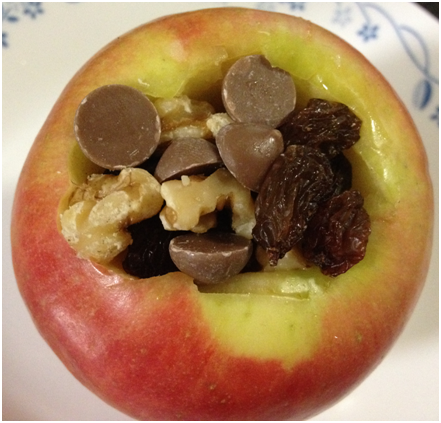 Baked apples are one of my favorites–great idea adding in chocolate chips! Love your new look/theme! I’ve always enjoyed your story-line, giving a punch to the recipes. Looking at your apple, I don’t mind getting poisoned by it. Hahaha! Hi CCUru! I love your new look blog. 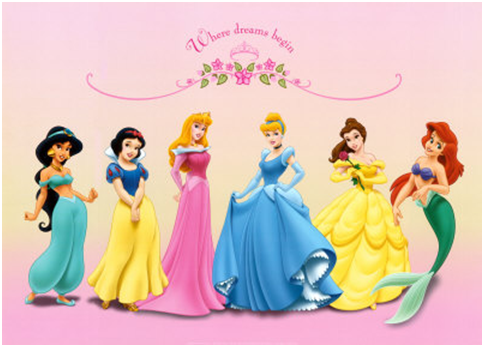 its fun, its bright and its ultra colour just like you and a Disney princess party is the ultimate way to kick it off. Fact, I”ll be at Hong Kong Disneyland at Christmas time and I’m going there with family, specifically so my little niece can see the Disney Princess Ice Parade, should be alot of fun. 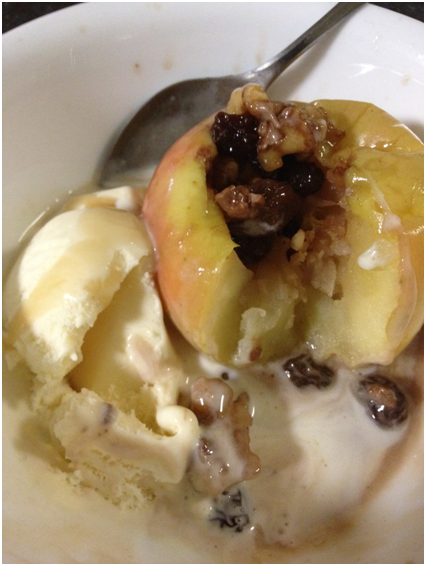 As for baked apples and icecream, a big yes from me! looks tasty and yummy as indeed I’m sure it was. These baked apples looks delicious! I’m in love with how simple they are to make. Love the new look 😀 congrats on your original recipe. It looks delicious! What a gorgeous baked apple! Super cute post! I love Snow White and have a weird affinity for Dopey! 🙂 This apple sounds delicious. Great creation! Looks wonderful! I LOVE baked apple anything and this is beautiful!. Oh my! I don’t even have words for how good that looks! This looks and sounds amazing. I love the new look by the way! That baked apple dish actually looks delicious – I think it’s the ice cream and stuffing that makes it look like, altogether, a tasty dessert (I’m usually not a baked apple fan)! YUM. And wowza, has your blog gotten an extreme makeover. It looks so professional, you’re so legit – which I guess you are, since you’re an amazing baker with a huge readership 🙂 I really like the M&M cookie background, so tasty. I want one! Or better yet, two with ice cream in between. This is certainly way more than *just* an apple – looks so yummy! OMggggggggggg, I love your new blog look. FAb & Light & Glorious…just like you, honey. I sooo wish I could come to one of your parties, cuz you..
i love baked apples but had no idea you could make them in the microwave for one – what a clever idea! love the new background, by the way! I almost didn’t recognize your blog! The baked apple looks delectable. This post was cute! I was obsessed with those princesses as a kid. I love your blog’s new look too – just as much as I like the look of this apple dessert. Yum! Omg. It looks so yummy!!! You changed the look of your blog, Uru! I’m loving it! It’s airier and lighter in feel / mood! Truly, you are an inspiring blogger. For someone your age, your understanding of the culinary world is very in-depth! Keep up the good work! Love your dessert! Snow White would have gobbled this up in a minute! Thank you so so much for all your sweet words! That is so cool this is an old time family recipe for you! My internet is so so slow today that all your pictures are not showing I just read the recipe and like your take on creating a lovely dessert of apple. That is some delicious looking apple you’ve got there fairy god sister…I mean CCU, as is your delicious new look for the blog! Well done. I’m not much for fairy tales, but I could totally get into it if it meant I could indulge in one of these baked apples- Especially if it was topped with ice cream! This looks so very delicious my friend!!! I am also liking the new look of your blog!! Who could resist this treat after hearing your story behind it, CCU! I am beyond obsessed with baked apples. My favorites are Fuji and Honey crisps, and I STUFF them with just brown sugar and cinnamon..A LOT of sugar. I need to make one soon! Yum! I love baked apples! I love the new look, and MM’s are my fave! I also love apples, but I’m not Snow White:), so I’ll have to try these “baked apples.” They look wonderful. Hey you, love the new look! And this apple really is to die for! I bet it would help anyone get over a dislike for (or fear of) apples! Love your story! SO creative – and glad S-dub got over her fear. I would, too, with an apple like that! 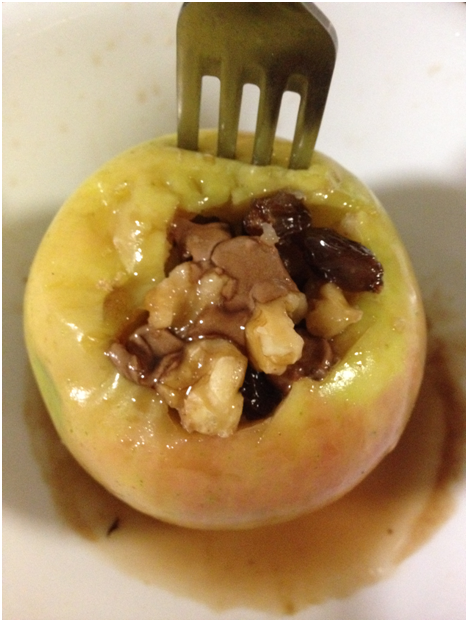 Chocolate in baked apples…very clever, love! Love the new blog. It’s spectacular. I adore baked apples. And I think Disney should follow the lead of Brave and bring women into the new century. So much deliciousness in one recipe! Drooling – I love it!! Yum! There’s nothing more tasty and delicious than baked apples. A simple dessert that you’ve taken to new heights. And I love the simpler new background. It makes it so much easier on the eyes and easier to read. Hey! New look for your blog! I like it, girl! The new design is gorgeous- so perfect! I think Snow White would definitely get over her ocd to have a bite of this dish. Yum! Reminds me of Once Upon a Time (the new television show based on fairy tales)- if you haven’t seen it I definitely recommend it! 🙂 Congrats! I love how you weaved the story around the apple, too cute! This looks great and who would have thought it could be that quick and easy 🙂 Your new look is fantastic, yay for no homework nights! Baked apples in the microwave are great. Like your inclusion of caramel chips – great idea. Sounds delish. And your new blog theme is good! Yum, l love baked apple! Tastes like apple pie, but so much easier and healthier 🙂 This microwave recipe sounds delicious! I love baked apples!! These are a perfect summer variation since they can be made in the microwave! What a quick apple treat. This looks so good! Is there anything quite like the smell of baked apples? YUM!!! Congratulations on your new award, CCU. A word of advice: I would strongly suggest you give credit to that Disney Image asap, they are not one’s to fool around with, they take their copyrights very seriously. This is a recipe I’ve made many times with apples and peaches, so tasty, but it’s more of a winter dessert when the fruit is not quite as fresh and good as it is in the summer. I adore the nuts in the filling, so delicious. This is the recipe for the fall when our local apples come to the market. CCU, your imagination is as vast as your cooking repertoire — love this! I never thought about the lingering effects of apple-phobia on poor Snow White… thank heavens for your quick thinking and quick dessert! Thanks for sharing this delicious yet simple recipe. Also just wanted to let you know I love the way you write, your blog is such an inspiration & I always look forward to your posts. Poor Snow White, she needs to get over it, that micro apple should do the trick. Fantastic to do it in the microwave, now I can enjoy it just for me, my family doesn’t love baked apples. But they don’t have Snow White Syndrome, they like pie and any which way but just not baked. I love the title of this post and I love baked apples! Clever post, CCU. And the apple looks simple and yummy. I love warm apple pie with ice cream! I bet this is healthier since there’s no crust. That means I can have two. For a minute I thought I was in the wrong place. lol Nice looking blog now – it’s easier to navigate and easier to actually read. Very, very nice! Uru, your comments on my blog are going into never-never land through my old commenting system. I’ve been putting them in manually at least 4 or 5 times now. What did you do before? That worked. Something changed and now unfortunately when I go to publish your comments, they completely disappear. I put Disqus in place as I was having trouble before and it works well, but occasionally people manage to comment through the old system. I did comment a couple of times from my phone so I’ll try only computer like I used to – hope it works! I love baked apples makes me even more anxious for fall to arrive here in the US, Snow White would dive right in forgetting her apple phobia (can’t blame her really PTSD) Perfect with the creamy ice cream. I like the new look of your blog Ms, the white background makes the writing stand out compared to your previous. Those dollies are so beautiful, snow white and the rest. My daughter used to collect Barbie dolls and still keep all of them intact until today. Nice dessert and the name is perfect, very creative and unique on how you made the apple stand out with the ingredients inside. Btw, I am following your fb page and if you don’t mind, please do the same for mine https://www.facebook.com/nava.kcom. Sound corny but don’t we all want more likes and I am the same. Tq so much Ms. Thanks for enjoying my ‘healthy’ dessert! Love the new background!! Also, love the recipe. I just bought some Pink Ladies yesterday and you already know I have the caramel chips. not a huge nut fan but will combine all the rest and make some baked apples tonight – what a great idea! 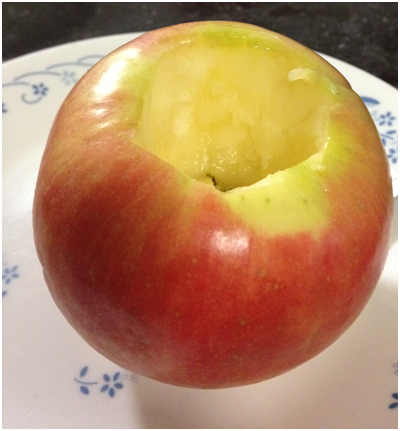 This is one easy and amazing baked apple! Could you be so kind as to mail a bag of caramel chips over?? I´m just half way across the world, lol! Love the story to compliment the beautiful recipe! I may have to try this with a childs class when themed with fairies! Fun! Love the new look and I love baked apples but in the zapper? How fast is that? Several years ago my stepson’s friends had a party at our home in Wodonga during their year 11. They came up from Wangaratta by train.. all the girls wearing princess or fairy costumes. It was great fun picking them up and taking them to Woolies for their favorite slumber party snacks. They would have loved your apples! Uru, we don’t have to be princesses to have issues *smile – I’m mad about baked apple … so this is one I will do very soon. Thank you. Photos good as always. I’m so glad I found your blog. I love reading it, this post is so funny. This is a great idea for a quick healthy snack. I’m always on the lookout for snacks I can whip up very quickly in the evening when the mood takes me and this is going to be added to my list. Hey! Why wasn’t I invited ? :))) I see you have made changes in blog design! I really like it! And yeah I try to look at the ‘healthy’ part too! I am sure even Snow White will not be able to resist this dessert. What a brilliant idea to stuff the apple with all sorts of goodies… I am so sure my kids would love this 🙂 Just realised you’re on Facebook, will catch up with you there as well. Cheers. Ohhh! New blog theme! I love the m&m background – perfect for your blog! I’ve never stuffed anything in apple before and how delicious it is to bake and eat with ice cream! Love the cookies background! I haven’t had baked apples in forever! You took them up a notch – delicious! Congratulations on the wonder award!